Plans are being considered to build offices and a car park in Old Town in order to ensure gaming and other digital creative companies who are part of the ‘Silion Spa’ cluster do not move away from Leamington. As part of its wider Creative Quarter plans to redevelop the area south of the River Leam Warwick District Council is exploring the possibility of building what it has described as a “multi-purpose structure” on part of the Court Street car park with “flexible, modular office space for the creative sector, car parking and events space”. The council has said it is aiming to create a “landmark place-making structure” that provides a “tangible statement of intent” as to its aspirations for the Creative Quarter. A report made to the council’s executive members says that feedback given to the council’s development partner Complex Development Projects (CDP) says there is a potentially urgent need for the building. The report says: “Feedback from the creative and digital sector through the stakeholder engagement process undertaken to date by CDP has revealed an alarming lack of suitable grow-on space for local creative businesses to the point where there are a number of businesses both in the gaming sector and the wider creative sector that are beginning to consider relocation out of the town. The structure in Court Street would include office space at ground level with three floors above this which would provide parking for up to 150 vehicles. The council has said that this is 97 more than what is currently provided at the car park and 51 more than what is currently being proposed for the temporary extensions of the car park as part of its parking displacement strategy tied in with its headquarters move plan. The top deck of the structure would be equipped with power and water and is likely to house a number of structures possibly based in containers or modular ‘pods’ allowing it to be used as events space on Friday evenings and over the weekend. 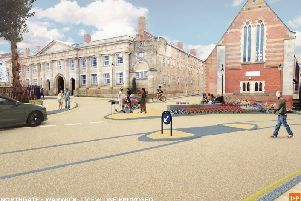 These plans are being considered as an alternative to the redevelopment the Victoria Colonnade in Victoria Terrace which was previously occupied by the Robbins’ Well pub. The council had wanted to buy the freehold of the property in order to redevelop it as part of the Creative Quarter project but the authority’s maximum bid would fall short of the owner’s asking price and there is no certainty as to whether a purchase could actually take place.